unhealthy relationship with food and lack of knowledge about the food we buy and fuel our bodies with. Be a smart consumer and opt for more natural foods (fresh fruit and vegetables, meat and fish) or food products with more natural ingredients. Go for healthy processed foods such as fortified milk and fruit juices or frozen produce which, although frozen, still have their nutrients. Do you frequent your favorite fast food restaurant for a quick and easy lunch or family dinner? Fast food tastes good and is convenient, but is it worth sacrificing your health for the sake of convenience? Eliminating fast food from your diet will significantly decrease your daily caloric intake and this will help lose pregnancy weight fast. You don’t have to spend hours in the kitchen to eat healthy meals. Organization and planning ahead are two useful skills to have when running a busy household. This will allow you to be able to cook and eat at home. You can discover the many healthy and tasty recipes by buying a health cook book or surfing the Internet for free recipes. Do you eat during the wrong times of the day? Some moms are so preoccupied with looking after the baby, running errands, and so on that they forget to eat until the end of their day. Not fueling your body properly and frequently will affect your metabolism’s normal rate of activity and prevent you from losing your pregnancy weight fast. Skipping meals such as breakfast or eating just one big meal for the day only serves to make your body conserve energy instead of burning it. A lethargic metabolism burns less fat making it difficult to lose pregnancy weight fast. Eating five to six smaller healthy meals throughout your day will keep your metabolism humming and you’ll burn more calories. How often do you find yourself watching favorite Soap Opera with some junk food? Or if you are depressed about your current body image, you soothe your depression with your favorite pint of Haagen-Dazs ice cream. Bad eating habits prevent you from losing pregnancy weight fast. Remove the temptation to eat junk food by not buying them. Why not buy healthy snacks instead? Emotional eaters can seek the appropriate help to learn how to conquer their urge to medicate themselves with food. Every little change and effort counts when you want to lose pregnancy weight fast. A busy mom’s life maybe fast paced, but if she’s not losing the pregnancy weight fast, it’s because she’s not getting enough exercise. Driving around town doing errands, picking up after your toddler and looking after a household can keep you busy but not burning the baby fat. Being conscious of how you live and what you eat will empower you to adapt to a healthier lifestyle. Long-term weight loss is three-quarters what and how you eat and one-quarter exercise. 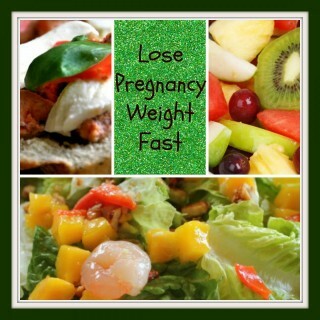 For a better quality of life eat right and exercise and you will lose the pregnancy weight fast and keep it off. Ready to lose your tummy to get a fit and toned body? You can lose the pregnancy weight for the long term by embracing a healthy lifestyle. Teresa Brown is passionate about cultivating women’s health and wellness.